Jamia Millia Islamia School Admissions 2018 - The application process for the Jamia Millia Islamia for class Prep, Nursery, 1, 6, 9 & 11 has started. The registration form is available for the candidates and same is given on this page. The registration for classes 6, 9 & 11 will be done through online mode. This article contains the application form, eligibility criteria, fee structure, important dates and selection process details. Scroll down to have a view of Jamia Millia Islamia School Admissions 2018. Jamia Millia Islamia (National Islamic University) is a public central university in Delhi established in 1920. It offers education from prep to Ph.D. level. At school level following schools has been established by Jamia Millia Islamia wherein education from Nursery to Class 12 is imparted. There are different school associated with Jamia for different classes. Jamia Senior Secondary School - Class 9 to 12 - Registration Started! Syed Abid Husain Sr. Secondary School (Self-financed) - Class Prep. to 12 - Registration Started! Jamia Girls Senior Secondary School (Urdu Medium) - Class 9, 10, 11, 12 - Registration Started! Mushir Fatma Nursery School - KG-I, KG-II - Registration Started! Latest Update: Jamia Millia Islamia last date to fill the application form for admission into class 6,9 and 11 has been extended to 4 April 2018. Candidates who did not fill the application form so far can apply now. The correction to the application form can be made by 7 April 2018. Jamia Millia Islamia has released the list of shortlisted candidates who have been selected through the draw for admission into Class Prep on 22 March 2018. The admission process will be started on 28 March 2018 and be concluded on 2 April 2018. Click on the link below to check details about the same. Jamia Millia Islamia application form for Mushir Fatma Nursery and Syed Abid Hussain Sr. Sec. School can be filled until 8 and 15 March 2018 respectively. The candidates can download the application form by following the link given towards the end. Students who are applying for Class 9 and Class 11 must have aggregate 41% marks or Grade C in the previously passed examination and not less than 33% in any subjects. Those opting for Mathematics in Science, Commerce or Arts streams should have at least 41% marks or grade - C2 in Maths in the qualifying examination. The 2-years extra relaxation will be provided for physically challenged students by the principal. The scholarship will be awarded to the students of Classes 10 and 12 of Jamia Sr. Sec. School, Syed Abid Husain Sr. Secondary School and Girls School who have secured 1st three positions in 9 and 11 in Science, Arts and Commerce streams. Students of Class 10 who have secured 1st, 2nd and 3rd positions in the annual exams of class 9 will be awarded a scholarship of Rs. 300, Rs. 200 and Rs.100 respectively per month for a period of 10 months. Students of Class 12 who have secured 1st, 2nd and 3rd positions in the annual exams of class 11 will be awarded a scholarship of Rs. 500, Rs. 300 and Rs. 200 respectively per month for a period of 10 months. The application process for Mushir Fatma Nursery and Syed Abid Husain Sr. Secondary School has started. The candidates can download the same by following the link below. The payment can be made through DD in favour of Registrar, Jamia Millia Islamia, payable at New Delhi. The application form for Class 6,9 and 11 will be available online. The candidates will be able to fill the form through online mode. Such candidates can make the payment of the fee via Credit Card/ Debit Card/ Net Banking. Jamia Millia Islamia Admit Card can be downloaded to appear in JMI Exam. The admit card will be released only for the students of Class 6, 9 and 11. The candidates will be able to download the admit card through online mode. If in case the candidates fail to generate the admit card online, the candidates can ask to the concerned test centre two hours before the test schedule along with the acknowledge slip for issuing duplicate admit card. The selection in Class Prep and Class 1 in Mushir Fatma Nursery School will be placed through the draw system on 27 March 2018 and in Syed Abid Husain Sr. Secondary draw for class Perp and 1 will be held on 21 & 22 March 2018 respectively. The declaration of result for class 6, 9 and 11 will be from 8 to 10 June 2018. The admission of the selected candidate will be held on 19 & 20 June 2018. Declaration of the list of Shortlisted & Waitlisted candidates will be declared by the date given in the table below. Jamia Millia School fee structure is given below. The fee from Class Prep to 5 in Syed Abid Husain Senior Secondary School (Self Financed) is Rs 21,090. The fee from Class 6 to 8 in Syed Abid Husain Senior Sec. School (Self Financed) is Rs. 26,500. The above-mentioned fee can be paid in two installments. The language of Exam: Hindi, English or Urdu. Syllabus: The syllabus is based on NCERT syllabus. The prescribed application form can be collected from Jamia Senior Secondary School from the office of principle by paying Rs. 100 from 25 March to 17 April 2018. Candidate can also download the application form via the link given on this page and send a demand draft of Rs. 100 in favor of Jamia Millia Islamia. Click here for Jamia Millia School Prospectus! 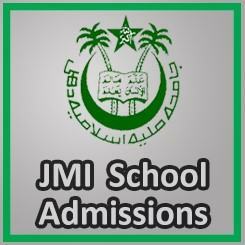 Click here for JMI Primary School Admission Prospectus!